In sports there is nothing more exciting than the last few seconds of a game and a winning buzzer beater or a final Hail Mary pass. My friends and I would play these scenarios out time and again on the playground. In the classroom I love using a digital stopwatch to keep kids on focused and to help them manage their time. What I love most though is a good old countdown. For my class, nothing brings order back and grabs attention like counting down from 5 to 0. My classroom can sometimes get a little chaotic. It of course is always organized chaos but often the energy level gets pretty high. I like students collaborating, moving around, and getting their “hands dirty” in learning social studies. What makes it possible is my countdown. No matter where they are or what they are doing, they know what to do when I get to 0. I like the countdown because it gives students time to transition from activity to listening. It gives them that chance to stop talking, writing, gluing, drawing or whatever it is their up to, and get ready to hear what it is I have to say. I also like the countdown because it keeps me from having to raise my voice to get attention. I had the pleasure of working with a PE teacher who managed to always keep his voice just above a whisper. It kept things calm and signaled to everyone that he was the one in control. Finally, I like the countdown because it works in just about every situation. I most often use it in my classroom but I’ve had success in grade level meetings with 90 kids present or out in the field when calling students in from recess or a game. Here are some things to keep in mind when using countdowns. Start louder and end softer. The “5” should match the voice level of the room. If the students are working in groups practicing a skit and the noise level is on the higher end my “5” will have to be loud enough to get most people’s attention. Each number after that will be increasingly quiet until I get to “1”, which is usually just below my normal speaking voice. 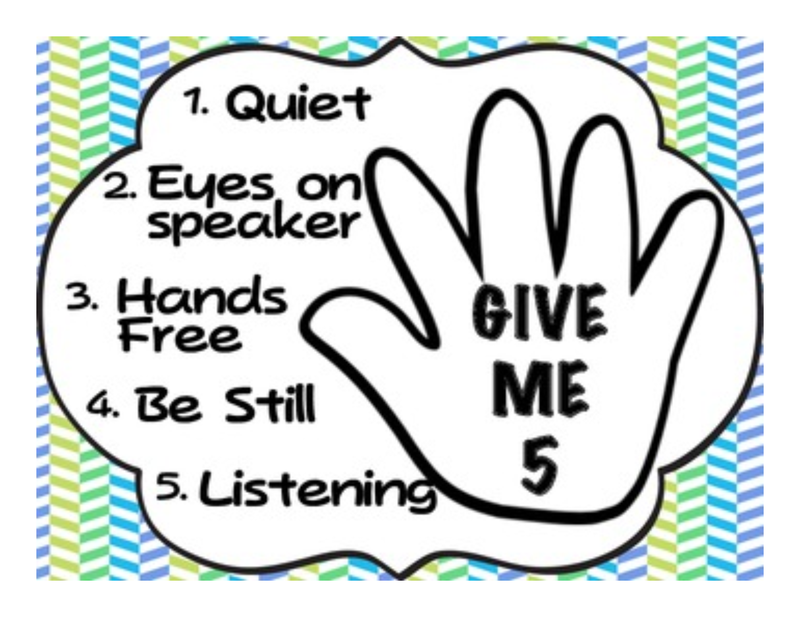 This sets the tone is an example to students that we are all getting quieter and ready to listen. Position is everything. My location in the classroom is always purposeful. If I know I usually have a student or a group of students who has a hard time quieting down, I will stand next to them when I do my countdown. I might also begin next to one student and finish at another – again being purposeful in my choice. If students are spread out across the room I will place myself closest the center or wherever I think will get the best results.